Monday through Thursday, 8 a.m.-3 p.m.; Friday through Sunday, 8 a.m.-4 p.m. 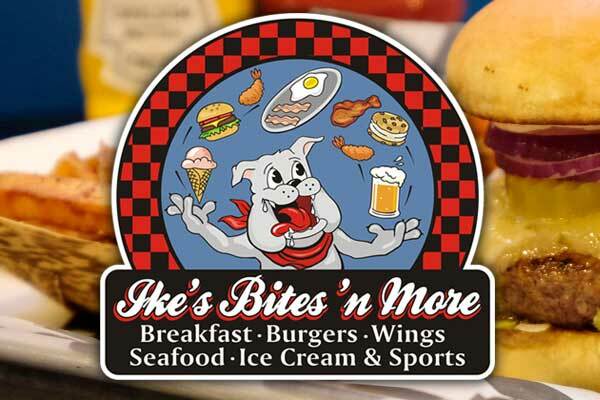 Welcome to Ike's Bites'n More located at 814 Ocean Trail in Corolla NC. If you're familiar with the area, you've probably heard of our sister restaurant Uncle Ike's. Though the restaurants have the same owner and similar dishes, we do things a little differently at Ike's Bites than we do at Uncle Ike's. But at both restaurants, we strive to bring you great quality with individual flair. We aren't just a burger joint, but some people say our burgers are the best they've ever had. From Hereford beef to Wagyu beef, these burgers are outstanding. People also rave about our gourmet salads, crab legs, steamed shrimp and famous fish tacos, which are a nine-year Uncle Ike's tradition that we had to continue at our new location. The all-you-can-eat breakfast buffet is popular with families and large groups as well. In fact, both locations are the place to be for families because in addition to great dishes at competitive prices, we offer fun! We have custom shuffleboard, 2018 Golden Tee, Multicades, 12 TVs for sports, outdoor seating and a full-service bar. More importantly, we offer a drive-through Window Service where you can call up from your car and pick up at the window. We also offer breakfast catering to large families with a 24-hour notice. Ike's Bites'n More is a remodeled fast food joint. We are so proud of how this restaurant looks, and we think you will love it too. We do great food fast, not fast food, so please remember patience is a virtue. As we say at Uncle Ike's, come taste the difference!